Go to the top of Santa's good list this year by raising money to support local families. 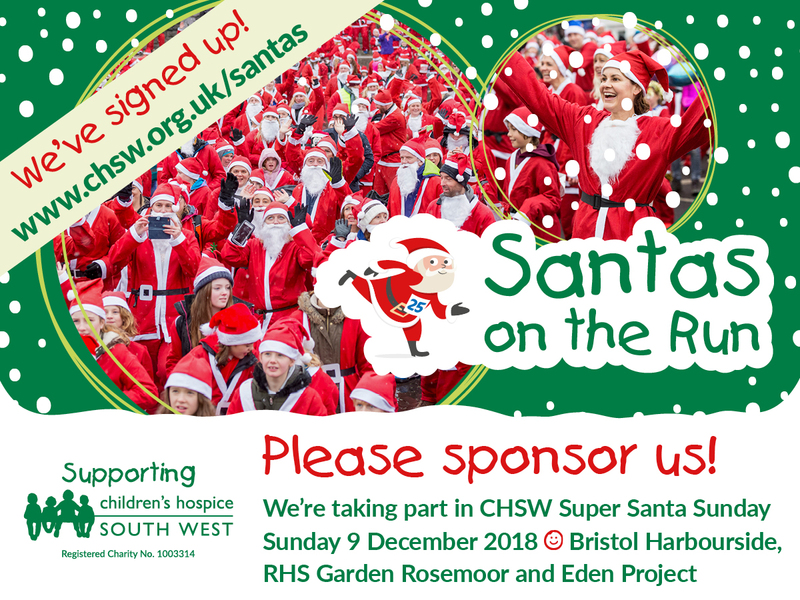 Santas on the Run will be returning to Bristol Harbourside on Sunday 9 December 2018! Run, jog, skip or walk your way around our festive fun 2k course. Join us at the Bristol Harbourside from 11.00am (the race will begin at 1.00pm) to make the most of the Christmas festivities before you run. You will find our event village in Lloyds Ampitheatre where face painters,entertainment, and our resident DJ's Cadence Entertainment will welcome you and get you in the Christmas mood. There will be food and refreshments available to fuel you so don't forget to bring some festive gold coins to spend! There will also be a fun and festive Santas warm up to get you ready to go. Our volunteer photographers will be on hand to capture all the fun of the day. Alongside our Santas on the Run at the Harbourside will be a Christmas market, restaurants, shops and ice skating which makes it a brilliant festive family day out. The sponsorship you raise for taking part in Santas on the Run will be a huge Christmas gift to our families and as a thank you for your hard work, we’ll be giving prizes for your efforts, so please get fundraising! Take Your Fundraising to Great Heights - the highest fundraiser will win two flights from Bristol to selected European destinations*, courtesy of flybmi. Not only that, but you can add to your flight experience with up to 8 days complimentary parking, two fast track security passes, and two exec lounge passes for Bristol Airport. Any adult who raises over £30 sponsorship, and any child who raises over £20 in sponsorship will be entered in to a prize draw. Your sponsorship will help to support the vital work of Children’s Hospice South West. *see terms and conditions for further information on the competition, and destinations. Bristol Airport is proud to sponsor Santas on the Run, named the best airport of its size in Europe and connecting Bristol with over 125 destinations around the world. Travel with flybmi from Bristol to Aberdeen, Brussels, Dusseldorf, Frankfurt, Gothenburg, Hamburg, Munich and Paris. Heart FM is proud to sponsor Santas on the Run Bristol 2018.